It’s Jump, Jive & Twang w/ Texas Hellkitten! A brief history of Texas Hellkitten as a DJ began as a sweet kitty from Corpus Christi, Texas. She grew up next to various dive bar jukeboxes and her Dad always had a stack of quarters for his little DJ. 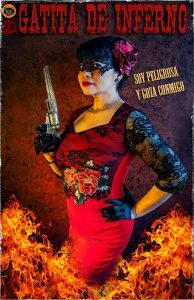 Texas Hellkitten Radio began in January 2009 when a rockabilly-lovin’ hellkitten stepped away from the h onky tonk jukebox and decided to share with the world what a music lover can find in the bars and nightclubs of Texas. It was little surf, a little blues, a mix of rockabilly and a lot of soul. Then in 2011, she hosted Jukebox Jive on Bear Family Radio. She also hosted a few record hops at Viva Las Vegas. In 2015, she joined Rockabilly Radio and hosts a show called Sunday Sin. Now she lives in Ohio and is part of the WDIF team with her new show called Jump, Jive & Twang. Check station site for broadcast times. You never know what you will hear on her shows, but the genres she enjoys playing the most are rockabilly (from around the world), vintage rhythm and blues, 50s rock, Texas music, and jukebox honky tonk. Sometimes she gets a little homesick and throws in some surf or music from her hometown heroes  Reverend Horton Heat and Freddy Fender. She is proud to showcase the untapped talents of Texas and the legends from around the world that inspire them. So sit a spell, have a drink, and enjoy!